More and more people understand that making eco-friendly choices at home is good for the environment. From recycling to using less water, composting to carpooling, households are getting on the green bandwagon. Did you know that the foods you choose to purchase and consume impact the environment? Making a few changes in the foods that you and your family eat can make a big difference. Many eco-friendly food choices are as beneficial to your health as they are to Mother Earth. One of the best green-eating tips is to choose locally-produced foods. Not only will you be supporting local businesses but you’ll also be selecting foods that haven’t had to travel as far, otherwise known as “food miles.” Keep in mind that blueberries from South America had to travel for thousands of miles to get here. Travel involves the use of fuel in airplanes and trucks, as well as the carbon emissions (known as air pollution) caused by your vehicle and others encountered along the way. Instead, choose foods produced as close to home as possible. Farmers markets and local co-ops often offer selections having low food miles. If you’re not near a farmers market, choose produce that’s in season, since it tends to require less travel to get to the produce section of stores. You can find a food’s carbon footprint by checking food sustainability scores at such sites as Eat Low Carbon. Read the labels of most processed foods and you’ll notice long lists of virtually unpronounceable names. As a rule of thumb for eating “green,” stay away from foods that contain more than a couple of ingredients. Processed foods require chemical inputs to produce not the most environmentally friendly practice, and most are sold wrapped in wasteful packaging that adds bulk to the trash in our landfills. 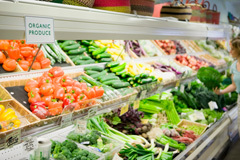 When possible, choose organic foods for their health value and because they require less chemical inputs to produce. Whether that’s fertilizer, pesticide, hormones or herbicides, going organic adds up to fewer chemicals polluting the soil, water and air. Another tip for eating green is to create meals that start lower on the food chain. Consider making fruits and veggies the main dish and treating meat as a side dish. Meat production produces 18% of greenhouse gas emissions worldwide. Cutting down meat consumption by even a little bit has as much environmental impact as removing hundreds of thousands of cars from the roads. When you do buy meat, look for labels that indicate the animals were grass-fed and that the product was organically produced without the use of hormones or antibiotics. Eating less meat is easy on the wallet, too. Greening your family’s diet is easy, but the benefits go a long way toward helping the environment and your health. Does your family eat “green”? Share your favorite green recipes with us in the “Comments” section below.